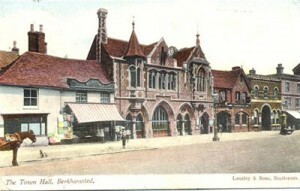 Berkhamsted Town Hall was built in 1859 by a charitable trust and extended in 1888-90. Its distinctive facade is well known throughout Hertfordshire. Most of the ground floor is used for commercial purposes; the community facilities are on the first floor. In the 1970s the Town Hall became derelict and was the subject of a major dispute, which dragged on for six and a half years. The hall had been closed partly because it failed to comply with fire regulations, partly because the income it generated was insufficient to maintain the building in good order. The Council, appointed as the corporate Trustee, was advised that the building was beyond economic repair. It decided to build a new hall behind the High Street facade, but its efforts were frustrated, at first because of a defect in its title, subsequently by a moratorium on local government capital expenditure. Meanwhile, the building continued to deteriorate and became the target of vandalism. In desperation the Council tried to sell the building, but the Charity Commission refused permission because of local objectors, known as the Rescue and Action Group, whose members included three 16-year old boys from Ashlyns School. Eventually the objectors, supported by many well-known Berkhamsted personalities: such as Graham Greene, Richard Mabey and Antony Hopkins, won the day. A new Trust was established in 1979, much to the relief of the Clerk to the Council who advised his Council that it no longer bore responsibility, an outcome he considered as second only to the Relief of Mafeking! The Hall was restored by the new Trust to full use during the period 1982-1999. The architect of the 1859 building, Edward Buckton Lamb, has been described, as being in the ‘Rogue-Goth’ camp, which ‘gloried in repetitive notchings and chamferings’. Establishment figures of the day disapproved of him, although later he was involved in the re-modelling of Hughenden Manor for Disraeli. Lamb was the choice of Lady Marion Alford, the mother of the young Earl Brownlow of Ashridge. One feature proposed by Lamb – leaded glass in the rooms overlooking the High Street – was never implemented. During the late 20th century restoration it was decided to modify some of Lamb’s designs in order to make best use of the available space. In particular, the original entrance from the High Street led down a long corridor to a ground floor foyer (beneath the present foyer) from which two staircases, forming in profile a St Andrew’s Cross, climbed to the first floor. By leaving out one staircase and repositioning the other one nearer the High Street, much space was gained on both floors. Before the Town Hall was built, a firm of London carriers occupied the site. The entrance to the stables was through a gate from the High Street on the west (Kings Road) side. When William Hazell acquired the site in 1856, there were three ‘messuages’, or apartments, above the stables, which at the time also housed a brewhouse, a washhouse and a barn. 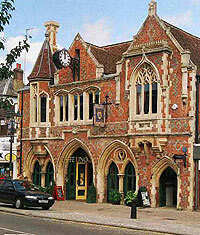 In 1859 and until well into the 20th century, the building was known as the Market House and Town Hall. During this period the main market day was Saturday but old directories state that markets were also held on other days [see French Market and Farmers’ Market pages]. Nowadays rent is charged to any trader who wants to trade in the market area, irrespective of the day of the week. The Market House consisted of the front portion of the building and was used for trading and to store market stalls; at the back there were washing facilities. In 1970 there was a fishmonger’s stall. Some ten years later, before the shopping arcade was built in 1983, there was a green-grocer’s stall run by Frank Stanley, a local trader who still has a flower stall in the market several days a week. The Market House was lit by a light-well in the ceiling. In 1998, the light-well was filled in and converted to offices and cloakrooms; some of the original windows overlooking the light-well can still be seen. The Market House replaced the Tudor Market House that had burnt down in 1854. The old Market House, the ground floor of which was open-sided, was opposite Prince Edward Street to one side of the High Street. Its position must have caused difficulty for coaches turning into and out of Kings Arms Yard. In August 1860, the new Market House was the subject of a scurrilous pamphlet, the anonymous author being upset that it was so far away from the old site. The freehold of the Tudor Market House was owned by the Duchy of Cornwall but leased to Earl Brownlow, who received all the market rents. The Duchy agreed to release the Earl from his obligation to rebuild the burnt-out building provided he gave at least £500 towards the new Market House. The Earl also had to hand over the market rents to the Town Hall Trust for 99 years, after which the rents would revert to the Duchy of Cornwall. In 1863 the Earl bought the freehold of the market rights from the Duchy. Sixty years later in 1923 the Town Hall Trust, bought this freehold from the Brownlow estate, ensuring that the Town Hall Trust would receive the market rents – presently worth £17,000 a year – in perpetuity. The area behind the Market House was occupied by small offices that had their entrances off the ground floor foyer. One was used as a police office; another as an estate agent’s office. The rooms backing on to the garden housed the Town Hall Keeper and his family. The first Town Hall Keeper, James Steggall, had previously been a railway porter at Berkhamsted station. The Shopping Arcade and Brasserie Carluccios. In 1983 the Trust converted the ground floor into a shopping arcade called Lambs’ Shops, although the name was rarely used. Lord Bernard Miles, one of the Trust’s patrons, officially opened the Arcade on 31st December 1983. It prospered throughout the Eighties but changing patterns of retail trade and the small size of many of the shops meant that some businesses ceased to be profitable and it became difficult to find new tenants. In 1998 the Trust entered into a 25-year lease with City Centre Restaurants, which converted most of the arcade into a Caffé Uno. Subsequently the Caffé Uno chain was acquired in 2006 by Paramount Restaurants and in May 2007 was re-branded as Brasserie Chez Gérard. In February 2012 Carluccios Ltd. took over the restaurant from Paramount Restaurants. The first floor of the Market House originally consisted of two rooms divided by a screen. One was used by the Berkhamsted Mechanics’ Institute, which had been founded in 1845. Before 1860, the Institute met mainly in people’s houses. The room at the east end was called the Institute Room and contained a lending library. Two of the original tables and the newspaper lectern are still in use. In 1867 Henry Costin, a member of the Institute who had emigrated to Australia, sent back the skins of various animals and birds which were stuffed and placed in display cases. Reluctantly the Institute committee decided it had no room for the kangaroo! Some of the fronts of the original bookcases and display cases are stored in the cellar; it is hoped to restore at least one in due course. The library steps and four of the original library chairs are also in store. The ground floor of the Sessions Hall building was used for some 80 years by the Mechanics’ Institute. There were two rooms – the Card Room and the Billiard Room, both entered from the ground floor foyer. There was no corridor and no exit to the car park; the eastern wall of the Town Hall at that time abutted on to the wall of another building. In 1983 a corridor was built linking the garden to the Water Lane car park. The ground floor was leased to a series of restaurant tenants. None succeeded commercially, so in 1996 it was decided to restore the premises to community use as a craft centre, known as The Making Place’. In 2007, ‘The Making Place’ was renamed as ‘re:create’. The garden was first created in 1890. The canopy was a new feature installed during the 1983 restoration to provide a covered area immediately outside the shopping arcade. The garden also became available for public use on weekdays. Later in the 1980s arrangements were made with a local developer for daytime access through the garden gate to Lower Kings Road. Don't forget the Community Market is on the 1st Saturday of every month. The Farmer's Market is on the 3rd Sunday of every month.